Most people who own motorcycles know very well the thrill that comes with wearing that leather suit and hitting the road to a new destination. The question is which are the best motorcycle trips in Europe? There are so many spectacular routes in Europe which have perfect views and memorable experiences. A good road for riding should have twists and turns for the purpose of bikers to be able to get the knees down and heart rate up. The surface of the road should also be smooth and the visibility should be perfect. A normal bike ride has the thrill, but you also need to be in an area that has awesome landscapes and a sense of adventure. That turns everything from good to perfect. The purpose of this article is to help you as the reader to learn about the exciting destinations in Europe and also some extra tips that could help you enjoy each and every moment of the ride. To start off this list of spectacular motorcycle trips in Europe, this place located in the United Kingdom can never be overlooked. Not at all. Derbyshire is a great place mainly because it has brilliant scenery which can be enjoyed by the bikers. The surface of the road in the route between Buxton and Whaley Bridge is great. The awesome view of Goyt Valley gives this journey a unique element and the route is along A5004, which has really long roads with bends that may entertain you as the biker. Just in case you are considering taking a motorcycle tour around the United Kingdom, this area should be seriously put into consideration. This is a destination located in Italy. The best thing about this route is that it takes you through Stelvio National Park in the Northern side of Italy. The surface of the road is smooth and very easy to maneuver. It is also important to note that learning some basic Italian might be helpful before you embark on the journey, mostly terms related to motorcycles. The main advantage is the fact that you get to enjoy the beautiful scenery as you continue your journey. This is an 11km stretch of tarmac is just the best road for bikers to use. It is also known to be one of the most dangerous roads in Britain; therefore, you are advised to be extremely careful. As much as the road has a 50mph speed limit, bikers always find themselves coming back time and time again. All bikers are advised to be focused on the road because of the sharp corners. The road is just next to the hillside and has a pub (Cat and Fiddle) where bikers meet and have random chats as they drink coffee. As much as this area is secluded and looks rural, it offers a route that is very easy to maneuver. The scenery is great for all motorcycle fans in that they get to enjoy a peaceful and quiet environment. Riders are also advised to be keen on the speed limits since areas like this may lack sign posts. Therefore, before embarking on this journey, make sure you do your research about the area to ensure you are not caught on the wrong side of the law. This might come as a shock to you but Finland is well known for its outstanding scenery. The route stretches from Bodomintie to Gunnar Hagen along with some great lakes and villages as well as state of the art motorcycle museums. This route runs across the highest mountains found in Romania for about 35km. It is normally closed in winter therefore it is better to try it out during summer. In this route, you will get to experience rocky lunar landscape and a plateau that is covered by snow. Just in case you have any Valentino Rossi fantasies, this route will make you get a similar experience because of the sharp bends. The experience in this road is great, cannot be compared by any other. Which is situated in France. Ever thought of going for a ride that has mountains, climbs, and great views? If so, this is definitely the place for you. All motorists who have visited this route that takes in the St. Girons region of the southern part of France will agree that it is very beautiful and at the same time safe. While on this route, there are so many places you can opt to stay and there are also camping options as well. This side of France offers so many benefits for you and your motorcycle. Learning French is also not so hard, so why not go for it! With all that said, your time has come. 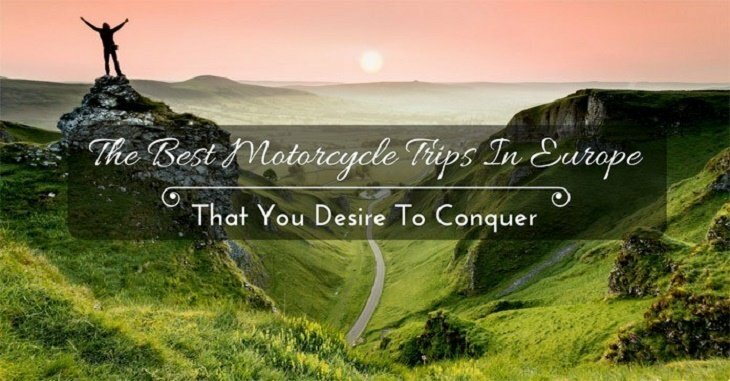 Make your motorcycling experience better and more fun by visiting the places that have been mentioned in this article, you will surely not regret it. Last but not least, plan all your trips carefully. This will ensure you always have safe and enjoyable journeys. In addition, it will also increase your confidence and inspiration to conquer new adventures in the future.